You might be asking yourself if etiquette is worth your time and attention. After all, etiquette sounds a bit fussy, like which fork to use at the dinner table, and maybe even old-fashioned in today’s fast-paced business world. However, professional etiquette is really just another way of saying respect—that you respect the people around you and respect the culture in which you work. Poor etiquette is a barrier to successful communication and can undermine business relationships. How others view you as a professional depends to a large degree on your attention to etiquette. No matter how talented or innovative you are, the impression you leave behind depends on how well you treat others. No one wants to work with rude or embarrassing people, and poor etiquette can destroy the morale of any workplace. Digital devices and constant connectivity can make matters worse by depersonalizing communication, so etiquette is more important than ever. Respect other people’s time, such as showing up for work and meetings on time. During meetings and conversations, don’t interrupt, even if you need to correct someone. Coarse language and profanity have become more common on social media, but articulate professionals don’t need profanity to make a point. Dress appropriately and practice good personal hygiene. Office cultures vary from formal to casual; when in doubt, dress a little more formally or modestly. Respect personal space. Knock before entering offices, and don’t barge into someone’s cubicle without being invited. Don’t gossip. It’s a waste of time and often disrespectful to others. Be mindful of noise levels, particularly in open-plan offices. Lastly, keep politics and other volatile topics out of the workplace. When you connect online with colleagues or customers, or whenever you represent your company online in social media, take care to overcome the limitations and risks of digital media. Avoid personal attacks. Don’t write anything online that you wouldn’t say to someone in person. On social media and in email or other communication, don’t hijack threads by taking over a conversation someone else started. To avoid confusion, follow the basic expectations of spelling, punctuation, and capitalization. Practice safe digital hygiene to avoid infecting your company’s systems with malware. Keep virus protection and operating systems up to date, and don’t click on suspicious links or open files from unknown senders. Don’t share inappropriate material, whether it’s jokes, photos, or anything else that doesn’t belong in the workplace. And finally, remember that digital is forever. Anything you write or post can be sent far beyond your original audience and will likely be saved in an archive somewhere. Learn about the remaining three zones by watching this video. You and your students will get added value with unique, free resources. From the groundbreaking Real-Time Updates to Business Communication Headline News to Bovee and Thill’s business communication videos for instructors, Bovee and Thill adopters can take advantage of an unmatched array of free resources to enhance the classroom experience and keep course content fresh. To see a wealth of free business communication resources you can use in your classroom tomorrow, visit https://blog.businesscommunicationnetwork.com/resources. First, before the interview, anticipate the questions you are likely to get. Second, plan your answers using the STAR method, which we’ll discuss in a moment. Third, during the interview, recognize what kind of question the interviewer is asking before you try to answer. By studying the job description, you can get a good idea of the questions you are likely to be asked in an interview. Start by identifying the skills and attributes the employer is looking for, both hard skills such as technical qualifications and soft skills such as leadership, listening, and teamwork. Interviewers will typically frame questions around these requirements, so you need to be ready. Now match those employer needs with your capabilities, education, and experience. For example, if the employer wants someone with leadership skills, identify ways that you have exhibited leadership at work, in college, or in volunteer activities. Think creatively here; even if your experience or skills don’t match exactly, think of ways that you demonstrate the general capability. After you have an idea of the questions you are likely to encounter, plan your answers using the STAR method, which works nicely for most interview questions. S and T stand for a situation or a task you faced in the past. This could be something on the job, in school, or in some other context. A stands for the approach you took in response. And R stands for the results. This would be the situation you faced. Next, think back to the approach you took and the results of your effort to resolve the conflict. When you are in the interview, be sure to listen carefully to the entire question. Then before you answer, take a second to recognize what kind of question the interviewer is asking. Although companies use a wide variety of interview questions, most fall into four categories that are described in this video. 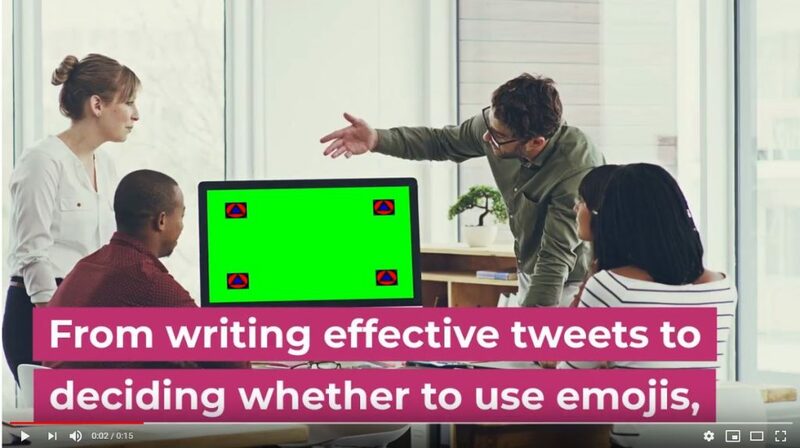 Note: A student version of this video is available. Every business communicator encounters situations that require ethical decision making. How can you be sure that you are making the right choice whenever you face one of these challenges? By following this four-step approach, you can be more confident that you are making the best possible choices, even in the most difficult circumstances. First, understand the kind of choice you are making. Not all ethical decisions are the same, as you’ll see in a moment. Second, identify the information your audience needs. Third, craft a message that conveys this information clearly and respectfully. Fourth, after you send the message, evaluate the outcome and respond as needed. This video takes a closer look at each step. Note: A student version of this video is avilable. The new QuickSwitch system from Bovée & Thill tackles the challenge of switching business communication textbooks with a unique set of tools that reduce the time and energy it takes to adapt your teaching materials to a new text. 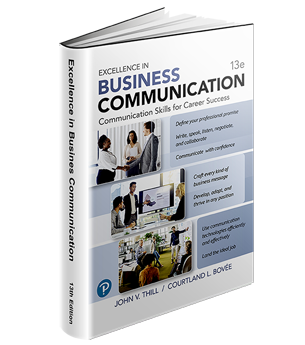 This exclusive system, developed by the authors, makes it easy to identify the best Bovée & Thill textbook for your business communication course and then quickly build your syllabus and lesson plans. Here’s a closer look at the how the process works. After you register, you start by selecting your current text from a drop-down menu to get a comprehensive transition guide to help you choose the best Bovée & Thill text for your course and migrate your existing course materials to your new text. * Detailed content mapping that shows where to find comparable content sections from your current book in the Bovée & Thill book you've chosen. If your current text isn’t available, please contact us through this webpage. Note that you can still take advantage of the Syllabus Assistant and Lesson Plan Assistant, even if a Transition Guide isn’t currently available for your text. At any point in the process or whenever you need them during your course, you can download a selection of lesson plan foundations customized for your chosen text. These lesson plan foundations provide core materials that you can integrate into an existing lesson plan or use to build a new plan. Each foundation covers roughly a week’s worth of subject matter, which you can adapt to your course schedule, teaching style, and other individual requirements. When you’re ready to make your move, visit the QuickSwitch and register for access. The system is free to use for any instructor who has adopted or committed to adopt any of the three Bovée & Thill texts. 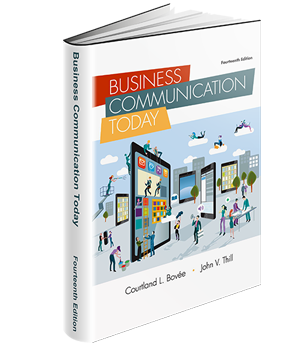 Business Communication Videos is sponsored by Bovee and Thill. Sharing unwelcome information is an unpleasant fact of life for all business professionals. No one like to receive bad news messages in business, and no healthy person likes to give them, so these messages can take a toll on everyone involved. However, it is possible to minimize the emotional impact these negative messages in business, because you can take steps to share negative information without being negative. Learning how to craft these messages with sensitivity and honesty will make the task easier for you as a writer and the experience less traumatic for the recipients of your messages. 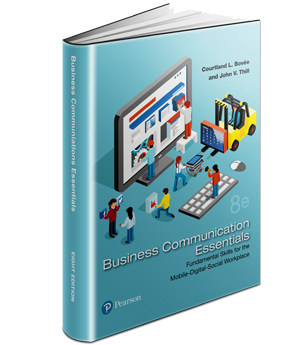 To see a wealth of free business communication resources you can use in your classroom tomorrow, visit https://blog.businesscommunicationnetw…. This video is appropriate if you teach visuaolization in business communication. Visual media have become a central element in business communication, and all business professionals have a responsibility to apply ethical decision making to the visuals they create, whether it’s a simple bar graph, a photo, a technical diagram, or the design of a web page. You and your students will get added value with unique, free resources. From the groundbreaking Real-Time Updates to Business Communication Headline News to Bovee and Thill’s business communication videos for instructors teaching business communication, Bovee and Thill adopters can take advantage of an unmatched array of free resources to enhance the classroom experience and keep course content fresh.To see a wealth of free business communication resources you can use in your classroom tomorrow, visit https://blog.businesscommunicationnetw…. To order an exaination copy of a Bovee and Thill textbook, visit this ordering page.